Discovering Amsterdam by Bike and Boat II. 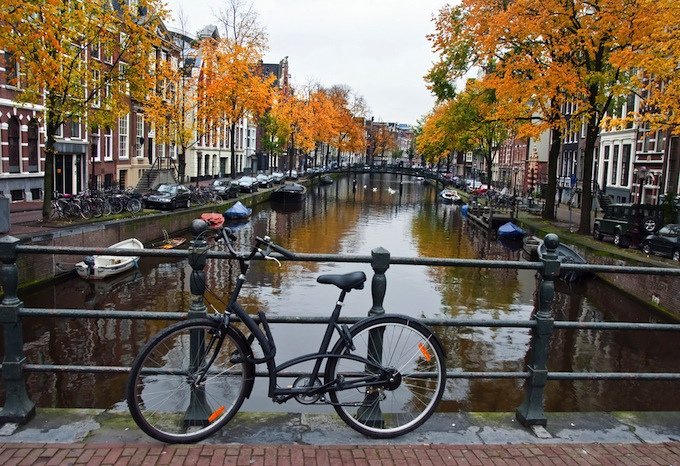 Discovering Amsterdam by Bike and Boat I.
Amsterdam is often described as the Venice of the North, and with 160 canals to navigate and up to 1,000 bridges to cycle over, the metaphor is appropriate. The sights and sounds of the city’s narrow alleys, busy waterways and colorful markets are best experienced slowly, and there is no better way to achieve this than by hiring a bicycle, or taking to the water. As a means of getting around Amsterdam, the bicycle reigns supreme. Special traffic lights and 249 miles of bike lanes have been incorporated into the city’s traffic plan to accommodate the cyclists, who make up 40% of Amsterdam’s road users. This can create problems for the first time visitor, who may be so absorbed in taking in the tourist sights that he is oblivious to approaching bicycles. Pedestrians should be aware of this and take extra care when crossing the street, or stepping off the pavement. Cyclists have to exercise caution as well. Trams are a popular source of public transport, and for a bicycle, tram tracks can be at best bothersome, at worst perilous. In wet weather, the picturesque cobbled streets can also be a hazard. Despite these considerations, bicycle hire can provide the perfect answer to sightseeing in this compact city. There are dozens of cycle-hire companies in Amsterdam and many of them have websites, where tourists can pre-book their bikes. This is advisable, as cycling is a very popular method of getting around the tourist hot spots. Most of these hire companies supply helmets on request, although the wearing of safety headgear is not compulsory in Holland. Additional items such as waterproof capes can often be purchased from the larger hire companies. Waterproof capes are a useful stand-by as, particularly in the spring, the weather in Holland can be showery. Some of the larger hotels offer their own cycle hire; details of these can be found on their websites. Again, pre-booking is advisable. Hiring rates are modest: from $11 for two or three hours, to $70 for a week. These rates, of course, vary from company to company, so a browse on the internet sites may save you money. With so many Amsterdammers devoted to their cycles, joining these friendly, warm-hearted people on cycle ways can be a fun experience. English is widely spoken, and most of the citizens are very willing to assist visitors who may have lost their bearings. The other great way to view this historical city is from the deck of one of the many tourist boats navigating the busy waterways that dissect the heart of Amsterdam. These spacious boats provide a very different view of the old town, something that can be missed by the cyclist or pedestrian. Elegant merchant’s houses, with their shapely gables, for which the city is famous, line the banks of the canals … relics of the days when Amsterdam was a major global trading post. Restored warehouses jostle cheek by jowl with graceful bell towers whose tuneful carillons ring out across the city, and colourful houseboats line the canal banks, lines of laundry strung across their decks, ubiquitous bicycles secured to cabin roofs. The daytime ‘100 highlights’ trips last about an hour, and cost from €11 ($14)) but there is a varied menu of cruises to suit most tastes and budgets. Top of the range are the candlelight supper cruises, which usually offer a three-course meal, and a gentle journey down the waterways, taking in the magical atmosphere of Amsterdam by night. This is a delightful way to spend an evening, and there are several to choose from via the internet, or they can be booked through that most valuable aid to tourism, your hotel concierge. Prices for a candlelight cruise start at €27.50 ($ 35) a five-course deluxe evening will cost around € 70 ($90). However, there are more informal and less expensive ways to spend an evening on the canals. Many cruise boats offer lighter refreshments, drinks and music … jazz being a popular choice. If your taste is inclined to fast food, some boats offer the opportunity to order a pizza on embarkation, which will be delivered, freshly cooked, during the cruise. Starting in the spring of 2009, there will be a tourist service from Schipol Airport for those passengers who have a long stopover. To while away the time, what could be better than a three-hour escape from the boredom of duty free shops and snack bars? A whistle-stop tour of the city, including a canal cruise, is an innovative proposition. A company called The Floating Dutchman will transport passengers from Schipol in an amphibious bus to Oosterdok, in the centre of Amsterdam. There it will take to the water and become a ‘cruise boat’. The canal cruise will take about three quarters of an hour, and include a short audio guide of Amsterdam in a wide range of languages. Afterwards, still on the amphibious bus, passengers will be taken back to the airport in time to catch their onward flight. For an outlay of about €40 ($50), this would seem a much more attractive way to pass a five-hour delay than sitting around a crowded airport. Tickets from the company’s office in Schipol Plaza. Whatever mode of transport visitors choose, the welcoming city of Amsterdam will never fail to enchant.